© 1984-2017 Gerhard C. Herbst. All rights reserved. Jewelry is one of the oldest forms of decorative art. Seemingly inherent to man's nature, unconnected civilizations throughout time have each developed jewelry which reflects their own unique period and culture. The work of Gerhard Herbst is primarily concerned with sculptural form and its aesthetic relationship to the body. Using techniques which have their origins in Bronze Age British Isle goldsmithing (1400-700 B.C. ), Gerhard often forges his jewelry from a single blank of material, creating dimension and volume through the application of specialized hammering techniques. 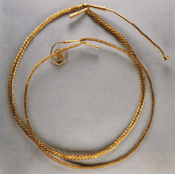 In principle, these same techniques were first employed in ancient Ireland to make jewelry such as the twisted ribbon torc and the "lunula" neck collar. The ancient islanders would hammer out their jewelry from a single ingot, creating pieces that were extremely durable and lightweight. As a result, hundreds of these pieces still exist and can be found in museums and private collections. 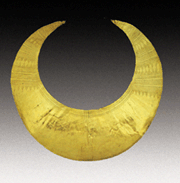 Gold Lunula Neck Collar C. 1800-1500 B.C. Nearly symmetrical this piece was well designed for a comfortable fit. Twisted Ribbon Torc C. 1200-900 B.C. twisting and hammering the metal.